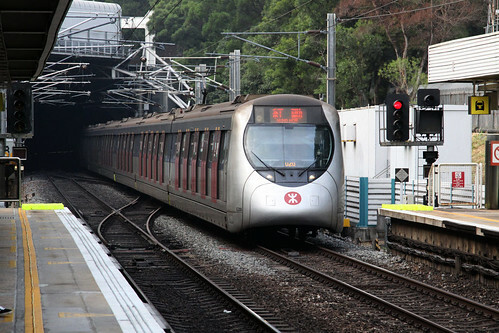 A few days ago I started on my coverage of the MTR’s East Rail line with a brief introduction – today we will take a journey along the line – or at least most of it. 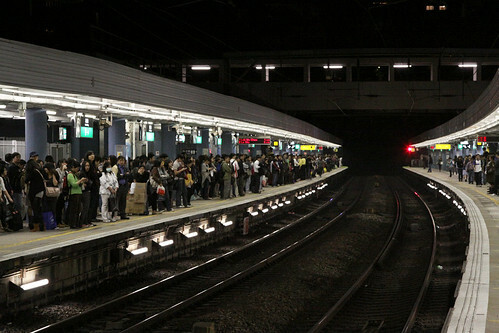 There is a reason why you can’t travel the entire length! The majority of East Rail stations look dated, with little refurbishment carried out by the KCR during their years of operation. 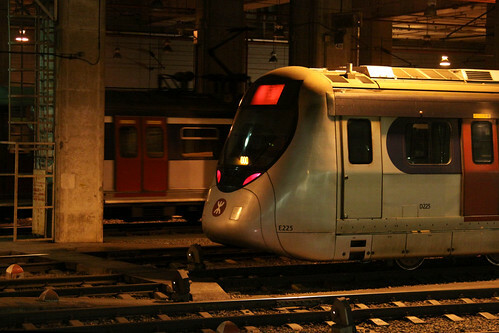 Since the rail merger in 2007, the MTR has commenced a minor refurbishment program, with vinyl decals with flower motifs placed over the tiles at platform level. However back on the concourse, everything still looks stuck in the 1980s. 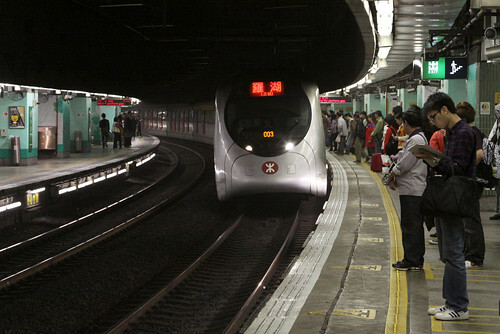 The line starts at Hung Hom station, located beneath a car park, bus terminus, and the Hong Kong Coliseum arena. 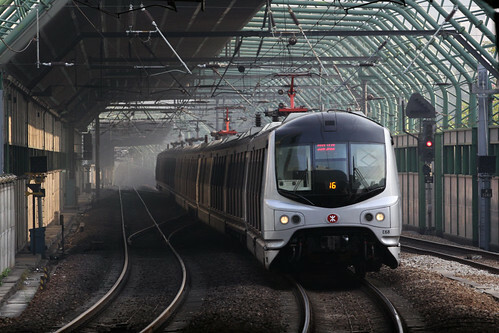 The station is also the terminus of the West Rail line and the Through Train service; with one island platform provided for Through Trains, and two island platforms for MTR services, with each island having one side dedicated to East Rail, the other side to West Rail. 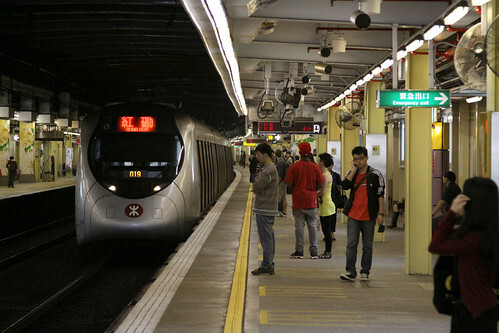 Originally named “Kowloon”, Hung Hom station commenced operations in 1974 as a replacement for the original station on the Tsim Sha Tsui waterfront. 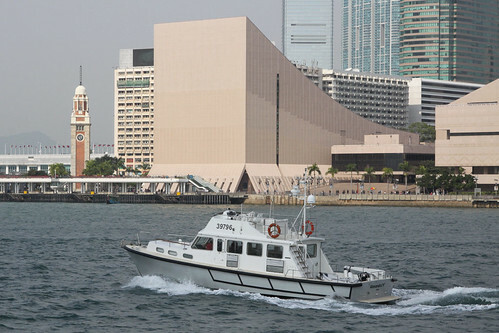 Today only the clock tower remains of the 1910 station, the rest demolished after the new station opened, with the Hong Kong Space Museum, Hong Kong Museum of Art and Hong Kong Cultural Centre built on the site. At Hung Hom station a commemorative plaque unveiled by Her Majesty the Queen can be found. Marking her May 1975 visit to Hong Kong, the vague wording on the plaque implies that the then-new station had yet to be completed. 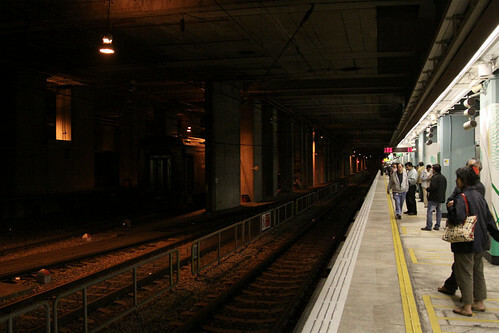 On leaving the station, a number of tracks from the adjacent freight terminal join the mainline, before the line enters the double track Tunnel 1A underneath Princess Margaret Road. The line emerges from underground, only to enter a second tunnel. This time it is a bank of noise barriers that partially encloses the tracks, in order to reduce the noise transmitted to nearby highrise apartment towers. 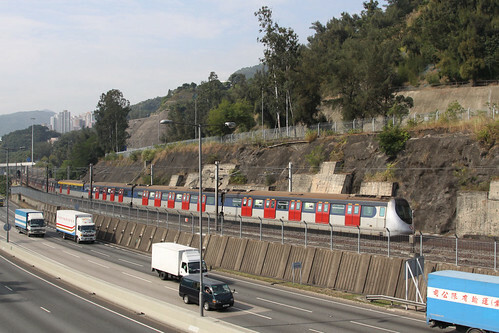 The noise barriers continue north until Mong Kok East station, which is located beneath a shopping and hotel complex. 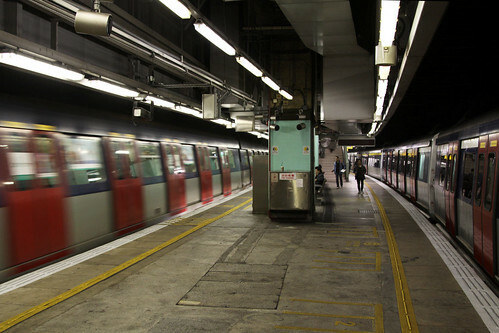 Despite the name, the station is separate from Mong Kok station on the MTR underground lines, with any interchange between the stations being a long walk via a network of public walkways and footbridges. The station is located on a sharp curve, with three platform faces, with normal services using the tracks either side of the main line. 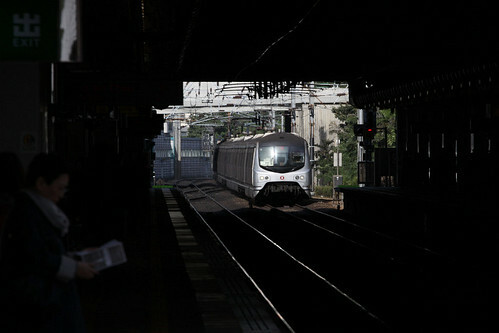 The third platform face is located on the western side of the station: I saw a train sitting in the platform during peak time, but the doors were closed to passengers. 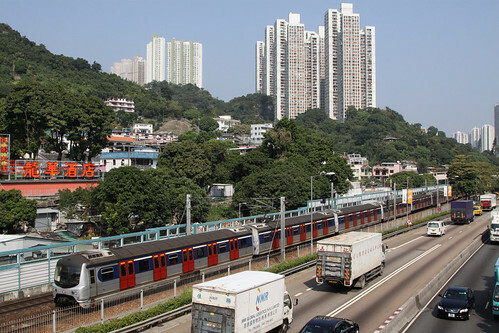 After Mong Kok East the line passes through the upper class suburb of Kowloon Tong, where shorter noise walls provide sufficient protection due to the lack of highrise apartment buildings. 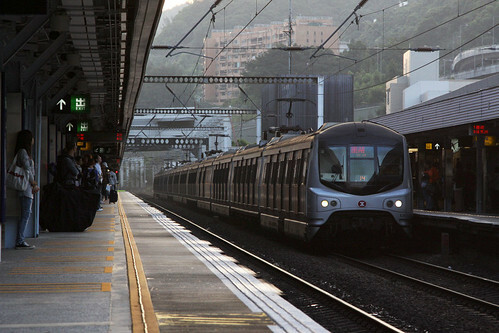 After the curve in the line the station of Kowloon Tong is reached. Purpose built as the interchange between East Rail and the MTR underground network, busy platforms are the norm throughout the day, as passengers to and from the New Territories change trains to reach other parks of urban Hong Kong. 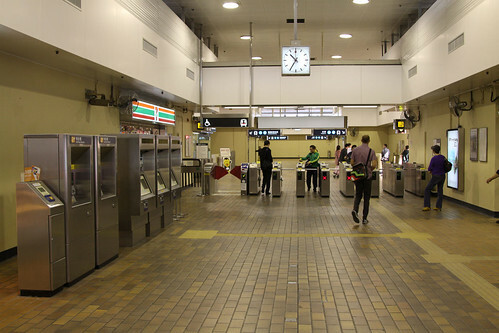 Kowloon Tong is the preferred interchange due to shorter distance between platforms, with the alternage interchange to the MTR underground lines at East Tsim Sha Tsui requiring a 5 minute walk through subways in the unpaid area, and an additional change of train at Hung Hom. 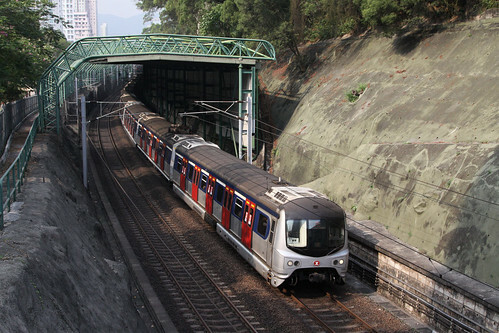 Immediately after Kowloon Tong station is the 2.3 kilometre long Beacon Hill Tunnel. The current double track bore was built as part of the 1980s modernisation of the railway, replacing the original single track tunnel opened in 1910, located a short distance to the east. 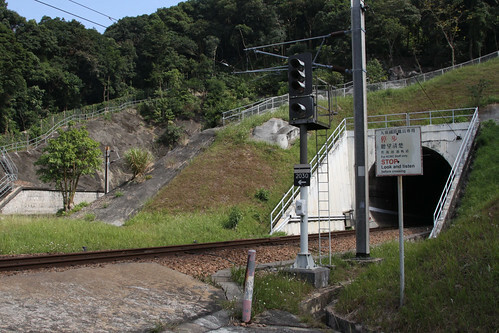 On exiting the tunnel the railway is now in the New Territories. After passing the outskirts of urban development, the station of Tai Wai is reached, interchange with the Ma On Shan Line. 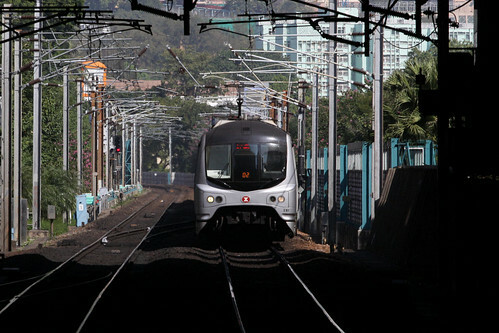 A single track connection is provided to the Ma On Shan tracks but no through services are provided, passengers changing trains via the network of walkways and escalators. After a few more noise barrier tunnels, Sha Tin station is reached. 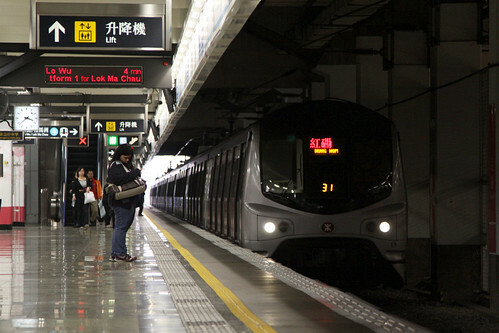 Provided with four platforms over two islands, the extra tracks can be used by express intercity trains to overtake the stopping all stations MTR services. 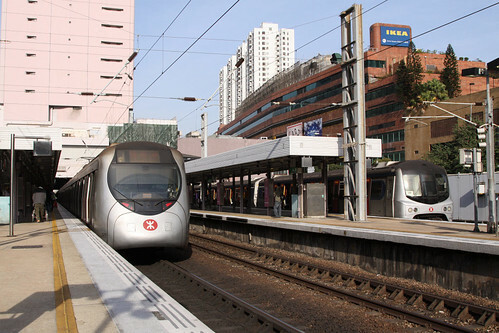 The station is located underneath the Citylink Plaza and New Town Plaza shopping centrers, forming the core of the Sha Tin town centre developed in the 1980s. Leaving Sha Tin station the railway follows Tai Po Road, with a number of low rise houses lining the adjacent hillside. 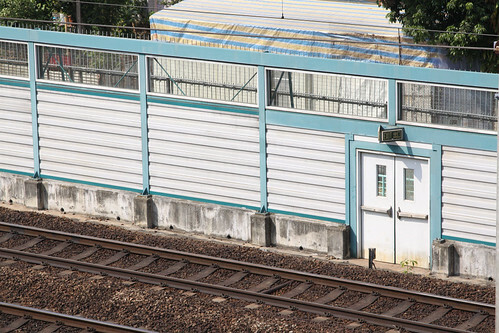 Again noise walls line the tracks, with regular exits providing an evacuation route in emergencies. Next up is Fo Tan station, junction for the branch line that serves Sha Tin Racecourse. The station itself is surrounded by a mix of industrial and residential towers. The station has four platforms serving three tracks, the centre track being used by originating and terminating trains during peak times. 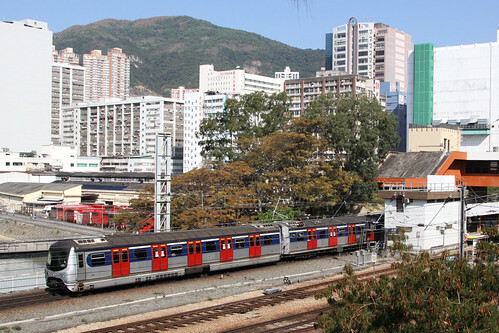 To the east of the station is Ho Tung Lau Depot, the main service centre for the East Rail EMU fleet, the works trains used on the line, and the KTT set used on the Guangdong Through Train. Atop the depot are a dozen or so 40 storey high residential towers, supported by an overall concrete deck. Just to the east of the depot is Racecourse station, with a single island platform. 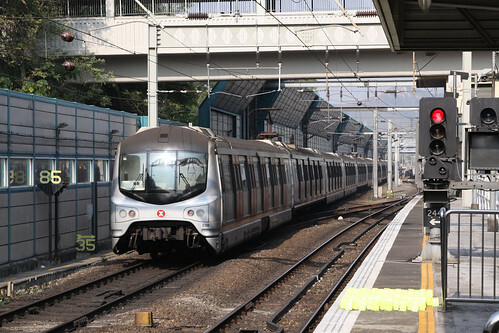 To serve the station before and after events at Sha Tin Racecourse, a small number of trains from the East Rail Line are diverted from the main line, missing out on the usual stop at Fo Tan station. 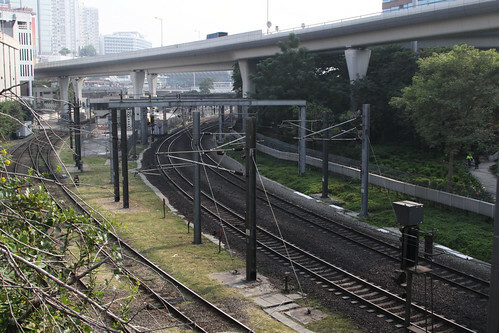 The lines from Fo Tan, Racecourse, and the depot rejoin a short distance to the north of the housing complex; where they run as double track beside the Tolo Highway. After a few more curves and a deep cutting, University station is reached. Located on a sharp curve, the station was originally penned in by short tunnels on either side (number 3 and 4), until they were daylighted as part of the 1980s track duplication. At the departure end of the platform more “S” curves are found, having a 90 km/h speed limit. More open country is passed through, but high fences still exist to block unauthorised entry, and make railway photography difficult! Continuing northwards, Tunnel no. 5 is encountered where the railway ducks through a hillside. The original single track tunnel was duplicated during the 1980s modernisation project, with the construction of a parallel single track tunnel a short distance away. The nearby freeway took a different approach, skirting the hill by using land reclaimed from the deeper waters of Tolo Harbour: an engineering challenge too great for the original railway in 1910. The scenery opens up on exiting the tunnel, running beside Tolo Pond at Tai Po Kau. 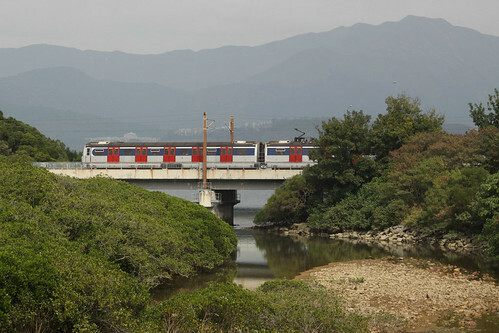 Also along the shoreline are a number of mangrove forests, with the high mountains on the other side of Tolo Harbour visible beyond the railway. 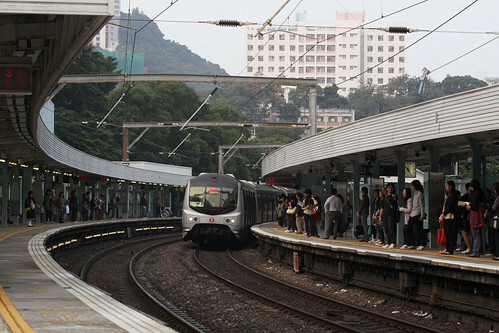 After leaving the coastal flats Tai Po New Town is reached, another 1980s development that is served by two railway stations: Tai Po Market has four platforms over three tracks, while Tai Wo has the usual side platform configuration. 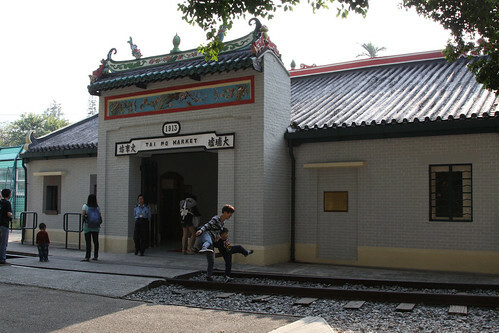 Located between the stations is the Hong Kong Railway Museum, located at the original Tai Po Market station. The station building forms the display area of the museum, with a number of locomotives and carriages located on the tracks alongside. Unfortunately a tall noise barrier blocks any chance of a clear photo of the parallel main line. More greenery is encountered beyond the built up area of the New Town, the railway running through low density houses as it winds through the surrounding hills with a number of footbridges crossing the line. While appearing useful for railway photography, reaching to the area is difficult unless you want to walk a few kilometres from the nearest station, or are happy to take your chances with the local green minibus service. 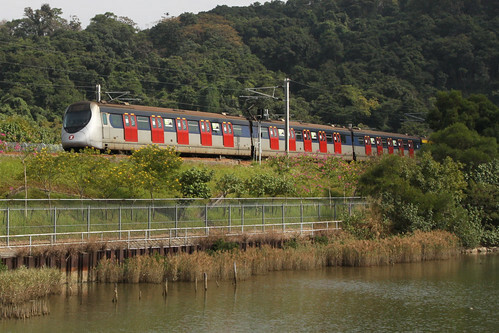 The next urban area to be found is Fanling-Sheung Shui New Town, served by Fanling and Sheung Shui stations. The track through this urban area is surprisingly open, unlike the sections of the railway encountered so far. 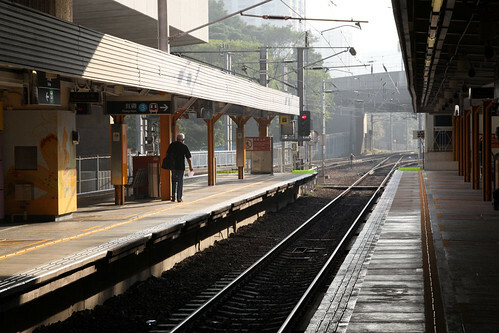 Sheung Shui is the last station open to the general public, being the junction for the border stations of Lo Wu and Lok Ma Chau. 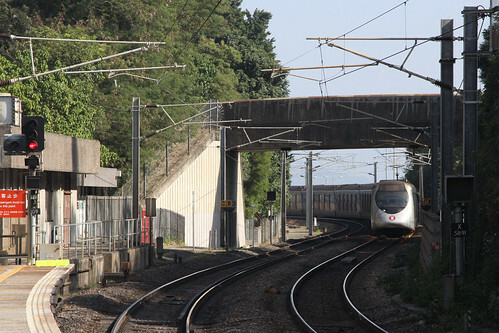 The junction of the two lines is just beyond the passenger platforms, the original line to Lo Wu being at ground level, while the newer Lok Ma Chau spur line running in tunnel until a short distance from the border. Officially the border stations are only for people intending to cross into China, with passengers required to hold valid travel documents. 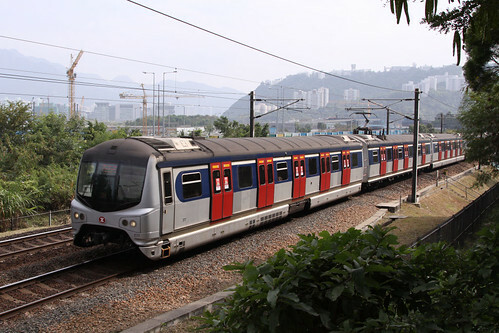 The border control facilities at both stations involve passengers leaving the MTR train, proceeding through the immigration checkpoint, then boarding trains on the Shenzhen Metro. 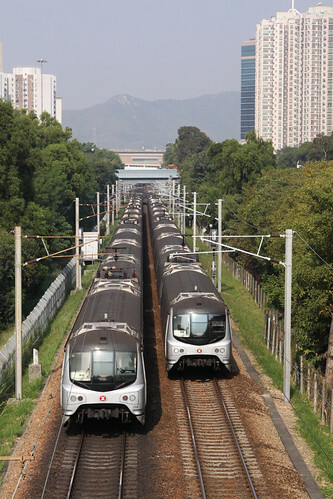 Only Lo Wu has railway tracks crossing the actual border, these being used by the Intercity Through Trains. While no travel document checks are carried out onboard the train, travelling out and back to the border station isn’t recommended, so without a visa for China I decided against making the trip. 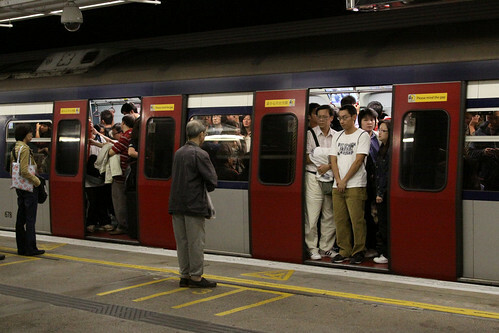 So far, that makes one piece of the MTR network I didn’t travel on! This entry was posted in MTR line guides, Transport and tagged East Rail, Hong Kong, KCR, Kowloon Canton Railway, line guide, Mass Transit Railway, MTR, New Territories, railway, trains. Bookmark the permalink.